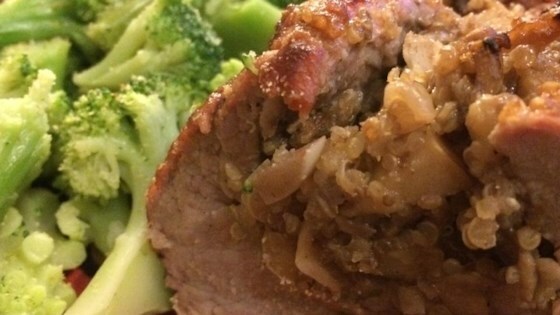 "I've been searching for stuffing recipes that don't use bread as I try and avoid gluten. This quinoa stuffing was my own solution. The sweetness of the apple and raisins in this dish plays nicely with baked yams. Hopefully there are others who will enjoy it as much as I did." For the wine used in cooking (and for drinking with the meal) I like a gewurtztraminer because it is sweet and fruity which will suit the stuffing. If you wish you can make a sauce from the drippings of the pork as long as you have not used a glass baking dish. To do this, remove the pork from the baking pan and cover with foil. Put the non-glass pan directly onto the stove and add a splash of wine, some chicken stock, and heat through while scraping up the brown bits. You may choose to thicken with cornstarch or allow to reduce to a saucy consistency. I didn't think this was good at all. Sooooo good! The stuffing was amazing even on it's own! I was a little skeptical of the ingredients, but this was so easy and good! I didn't have mushrooms on hand so I replaced them with black currants. Delicious. This was excellent! Highly recommend. Very good and fancy. Took a bit of time though.